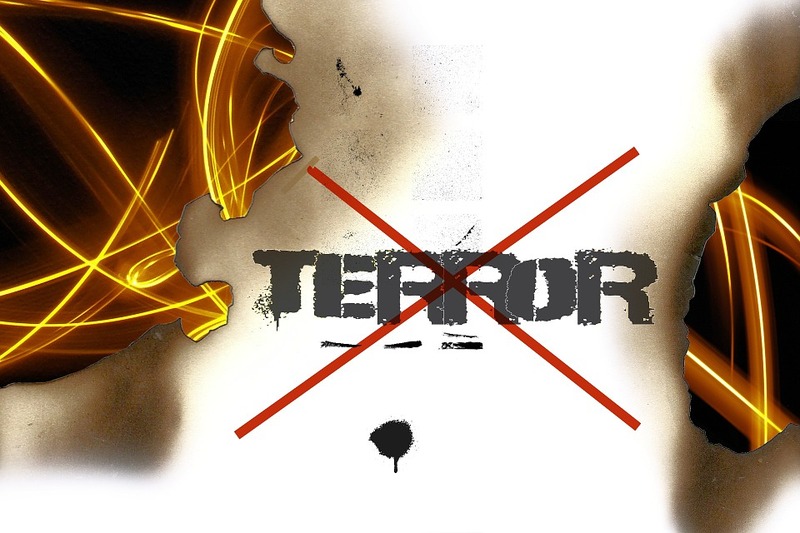 Today we were provided with global terrorism data to analyse. This was one of the most feature rich datasets we’ve received in the Data School. There were several storylines that I could have focused on (terrorist attacks involving trucks, terrorist attacks using chemical weapons, terrorist attacks with related incidents, terrorism involving hostages/ransoms, focusing on a particular country such as Yemen/Syria, terrorist attacks with multiple incidents, terrorism involving media, terrorsim involving educational institutions etc.) As you can tell, it was a tough choice narrowing down the choices to pick only one. In the end, I settled on investigating the rise of ISIL as one of most nefarious terrorist groups out there. To judge how it ranks with other groups, I looked at both the instances of terrorist activity (number of records) and deaths. 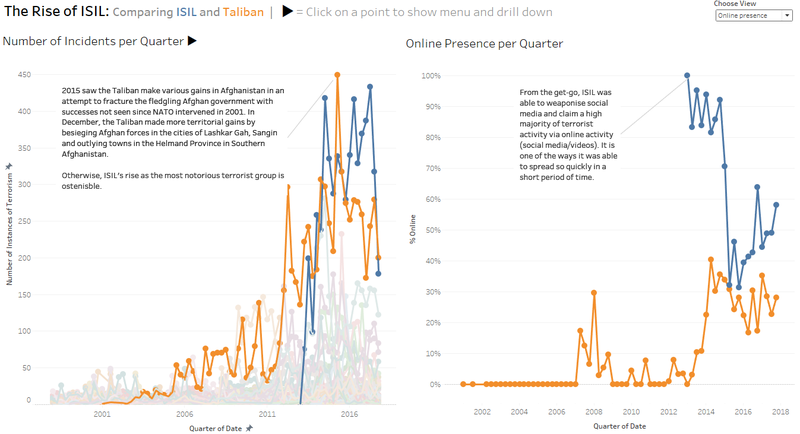 I noticed the Taliban were supplanted by ISIL as the largest terrorist group, hence decided to compare the two groups in the first dashboard. 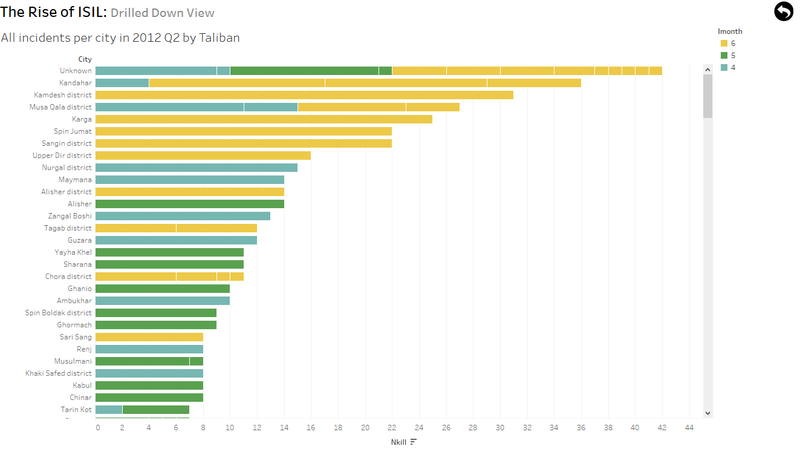 There was only one year where the Taliban resulted in more terrorism so I decided to look into that particular period and found out that it was a bit of an outlier where they able to secure a few Afghani cities. Pointing this out in an annotation provided for a better story. I also wanted to look into the percentage of claims of a terrorist incident were via social media. This one was particularly interesting as I had read in the past that ISIL were leveraging social media to influence more people of their doctrine. It was noteworthy to see ISIL from the get-go used social media to a much greater extent than that of the Taliban which may be a reason for their prominence. 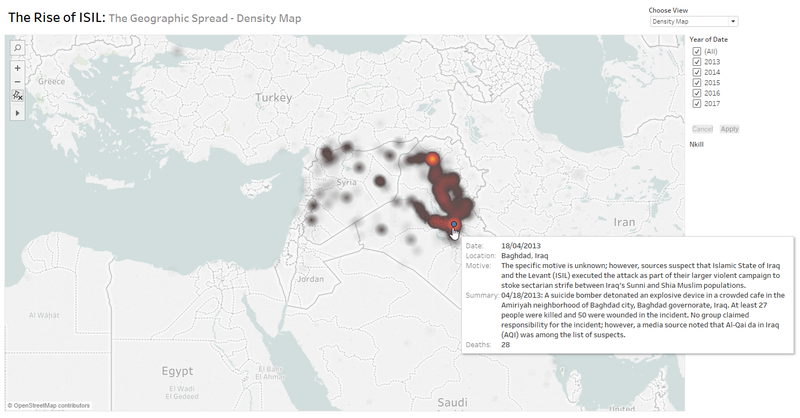 For my second dashboard, I wanted to look at ISIL’s activity on a global scale by plotting the latitude/longitude of the events on a map. I used both a density and regular map as they both highlighted different insights. 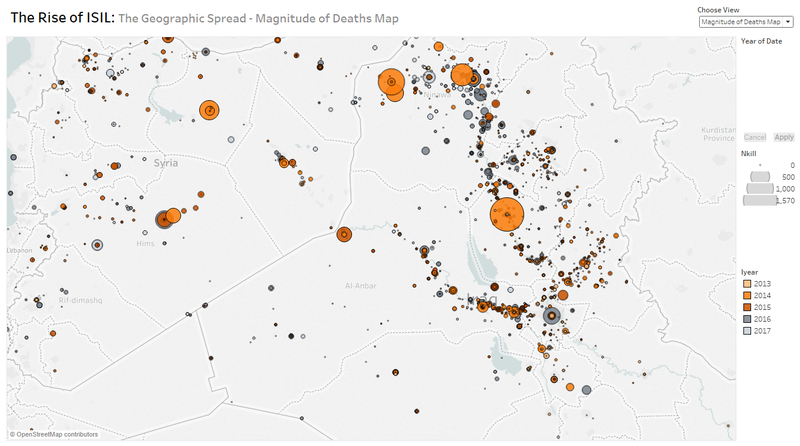 I initially set up an animation that showed the spread of ISIL activity but ultimately did not go that route as animations can’t be viewed on Tableau Public. 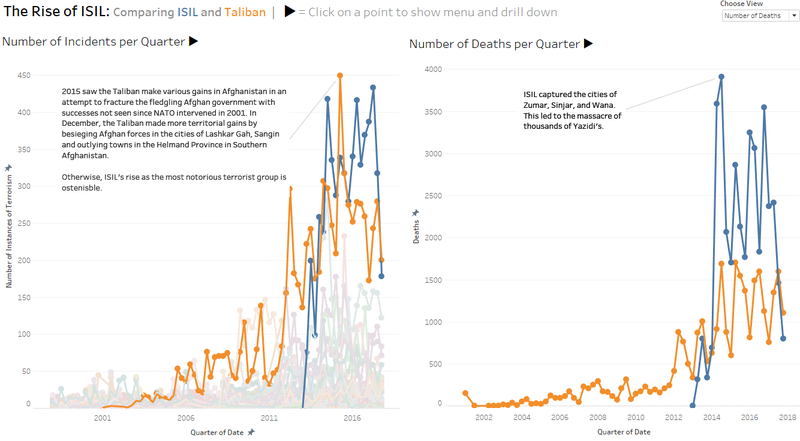 I felt the first dashboard comparing ISIL and Taliban was still lacking so I made separate dashboards allowing the user to drill-through a certain quarter to investigate more on what was happening during that period. This is so we can see why in a certain quarter ISIL/Taliban were particularly more active than in other quarters. It’s not the most advanced drill-through but it was still a good option for the end user.